A drone can fly an 18-hole golf course in approximately 2.5 hours. The resulting course insights are achieved from two unique perspectives. 1) Altitude: observing a course from 250-400 ft. viewed from a "birds eye" perspective allows you to view turf health unbiased and to view course features in their true interspatial relationships. 2) A drone using a multispectral sensor can provide detailed turf analysis revealing early signs of turf stress, irrigation patterns, fungi pressure, unwanted turf encroachment and other undesirable conditions. 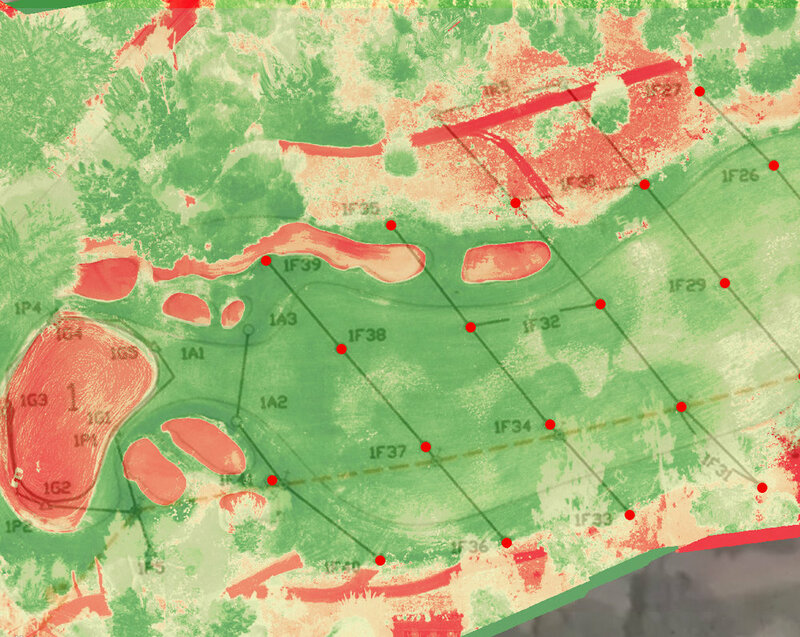 NDVI results reveal gaps in sprinkler patterns. Drone scouting can assist a supervisor manage water successfully and ensure water costs are inline with usage. Having both a higher perspective of the course plus the multispectral analysis, a drone can identify water problems before they become brown doughnuts on the fairway. Sprinkler performance can be monitored flight over flight. You an see the effects of individual sprinkler head adjustments. Also identify sprinkler head failure earlier by detecting stressed turf in under water areas. Aerial images and analysis give a supervisor two distinct advantages, multispectral analysis and a 'birds-eye" view. Walking or driving a course the turf color tends to blend together to the human eye making variation difficult to distinguish. Getting a new perspective with a drone makes course problems easier to detect. 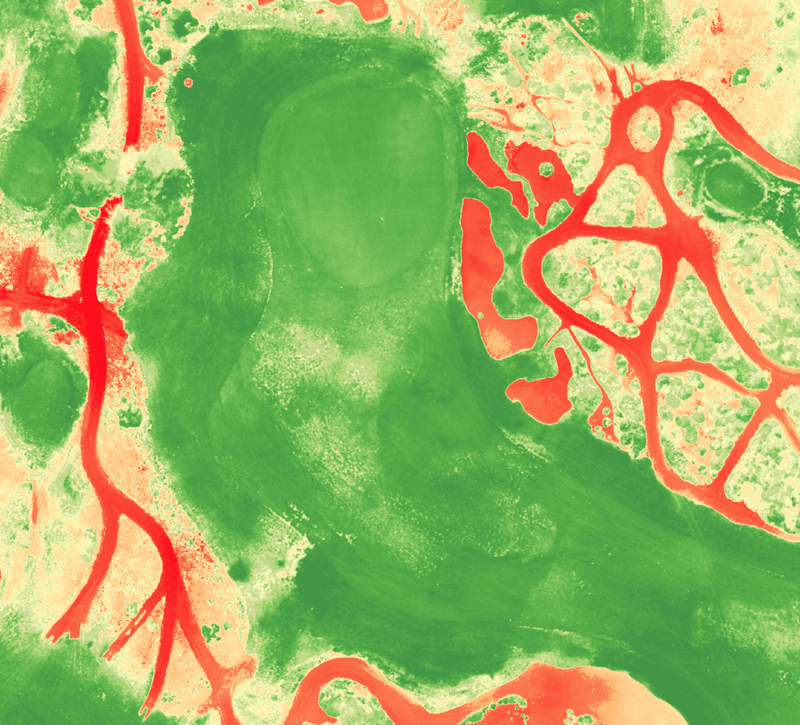 Using multispectral sensors, course images can be analyzed to identify stress areas before they can be detected with the human eye. Sensors capture individual light bands to include infrared. Software then runs a multitude of algorithms to isolate stress and other patterns. NDVI processing reveals low turf vigor on the approach. Multispectral analysis locating fairy ring fungi on course. Many elements can threaten the health of a course. Using the specialized multispectral algorithms, most any organism can be isolated then monitored for treatment. Different type of grass, or any plant, has a different light reflectance than neighboring vegetation. For the golf course, bent, fescue, rye, to name a few, all have difference reflectance values. Drone imagery can capture the different turf or other vegetation and locate it within the course. This can be useful for either monitoring, seeding, or eradication. Drone image separating bent, fescue and rye within course. Achieving accurate and detailed turf analysis requires specialized sensors to do the job right. 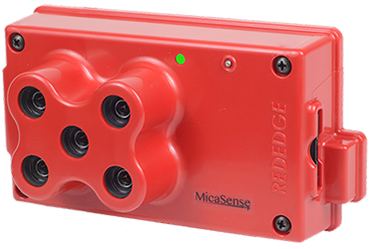 We fly the MicaSense RedEdge, an advanced, lightweight, multispectral camera. The RedEdge provides accurate narrow multi-band data for agricultural remote sensing applications. Simultaneous capture of five discrete spectral bands. Narrowband optical filters provide full imager resolution for each band. Integrated downwelling light sensor for image capture during cloudy conditions. Pre-flight/Post-flight radiometric calibration for the highest quality results.